Uppsala, Sweden—November 27, 2012—IAR Systems® today announced the availability of a new product edition tailored for small applications development using IAR Embedded Workbench® for RX. The Baseline edition is targeted at developers working with smaller memory Renesas RX MCUs and is offered at a price substantially reduced from that of the full edition. The Baseline edition is limited to a code size of 256 KB but provides full compiler and debugger functionality. IAR Systems is announcing the new edition alongside the latest version of IAR Embedded Workbench for RX, version 2.41. Renesas Electronics’ RX family is available in a wide range of memory sizes. For developers working with many of the popular low-power RX200 MCUs, the new edition is a perfect fit. More than half of the RX200 devices fit into the 256 KB limit of the Baseline edition of IAR Embedded Workbench, and in addition a number of the high-performance RX600 devices are covered. To see the memory size of specific devices, visit www.renesas.com/rx. IAR Embedded Workbench for RX supports all RX devices. As previously announced by IAR Systems and Renesas Electronics, the highly optimized code created by version 2.41 together with the RX core achieve 3.12 CoreMarks®/MHz, a world-record benchmark score. The new version also adds improved functionality, including an extended inline assembler and a new Call Graph window displaying all calls made to and from each function from any source file in the active project. IAR Systems offers a beneficial upgrade path for Baseline customers transferring to larger memory sizes than those covered by the edition. 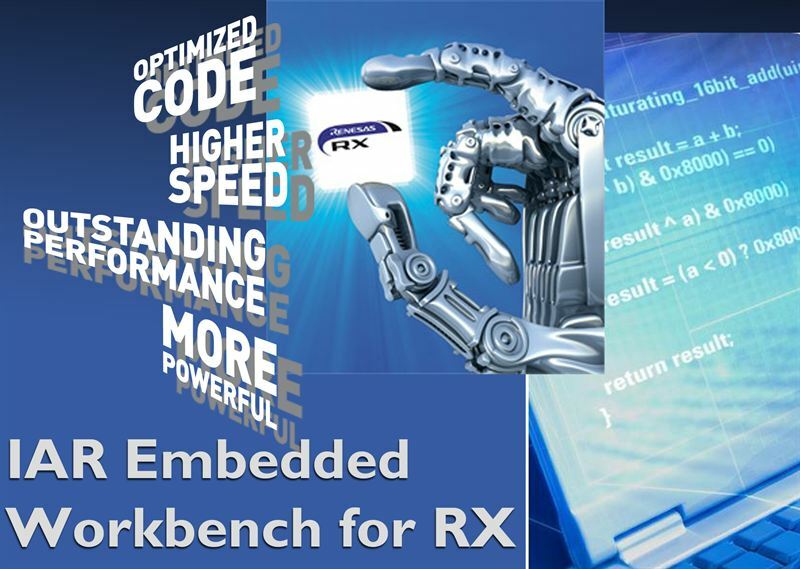 Read more about IAR Embedded Workbench for RX and download free evaluation licenses at www.iar.com/ewrx. For pricing information, contact your nearest IAR Systems sales office.